Have you ever just been in the mood for a piece of cake? And you look around the kitchen in search for a delectable dessert only to come up empty-handed? This happened to me a few weeks ago, but fortunately it was the weekend and I had a spare hour. So I searched the internet and found a recipe for a one-bowl chocolate cake. The name sounded promising, for fewer bowls used would equal fewer bowls to clean up later on. The recipe also showed promise because the ingredients were all things that I normally have in my cupboards. I halved the recipe to just make one round pan instead of a more complicated layer cake, swapped the flour for the whole wheat version, and used agave instead of sugar. While the cake baked I searched the internet for a frosting. Whipped cream sounded good to me, especially because it only required three ingredients. It turns out that I did have a cake in my kitchen. All of the ingredients were there, it just took a little bit of creativity and some mixing to make the cake a reality. Within an hour SensitiveHusband and I were able to enjoy this great dessert. Preheat oven to 350 degrees F. Grease and flour one nine-inch round pan. In a large bowl, stir together the flour, cocoa, baking powder, baking soda and salt. Add the agave nectar, egg, milk, oil and vanilla. Mix for 2 minutes on medium speed of mixer. Stir in the boiling water last. Pour into the prepared pan. Bake 30 to 35 minutes in the preheated oven, until the cake tests done with a toothpick. Cool in the pan for 10 minutes, then remove to a wire rack to cool completely. Whip cream until almost stiff. Add agave and vanilla; beat until cream holds peaks. Spread over top of cooled chocolate cake or another dessert. 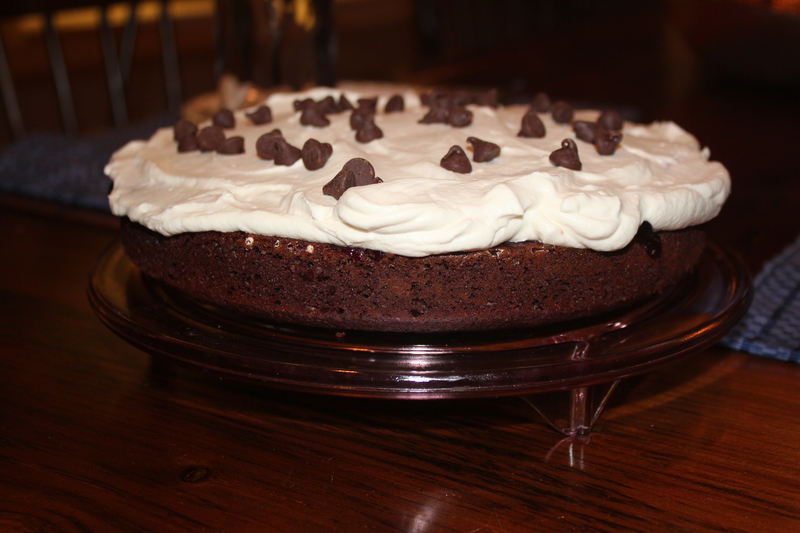 Top the whipped cream with grain-sweetened chocolate chips if desired. I am sharing this recipe with Simply Sugar and Gluten Free, Miz Helen’s Country Cottage, Food Trip Friday, Cybele Pascal Allergen-Free Cuisine and Sweet as Sugar Cookies. 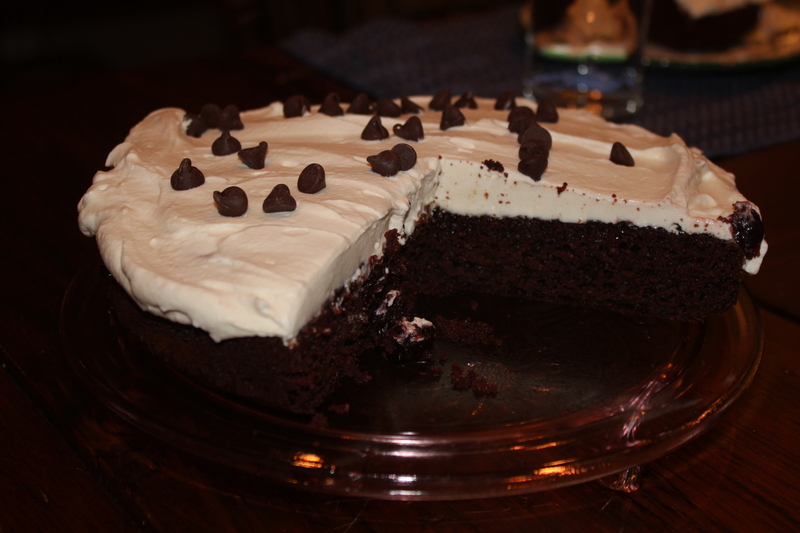 This entry was posted in Recipes - Dessert and tagged Agave nectar, Cake, Cane sugar free, Chocolate, Whipped cream, Yeast free. Bookmark the permalink. Sounds simply devine. It’s in my queue to make in the very near future. I’m missing sweets and am looking forward to something sinful without the sugar (or yeast). Thanks for the recipe! This sounds like a delicious option for a prediabetic birthday cake; I’m definitely going to try it! Thanks. Wow! Such ingenuity…I have argave at the moment, seating at the corner of the kitchen because I don’t have use for it, seeing your recipe is simple—would want to try this…thanks for sharing! This looks like a delicious cake and I would just love your Agave Whipped Cream, I might just pile it really high on that great cake! Hope you are having a great week end and thank you so much for sharing with Full Plate Thursday.